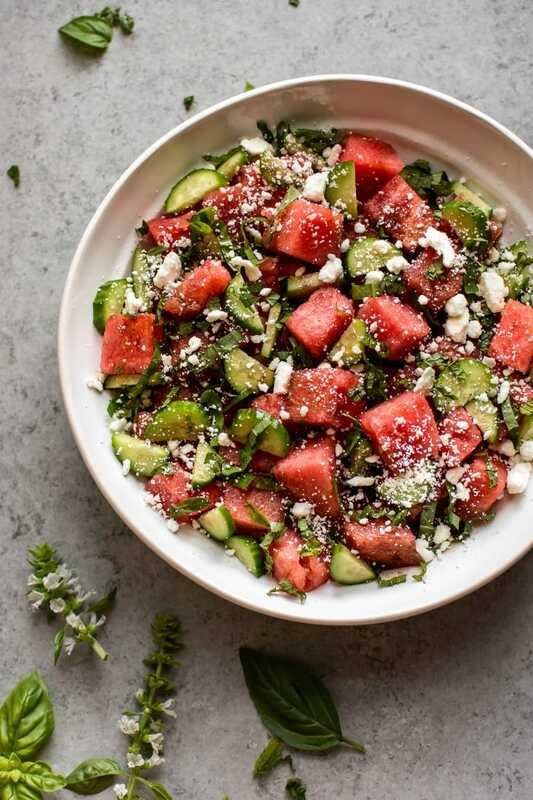 This watermelon feta salad recipe is a fast, fresh, and pretty summer salad that’s really simple to throw together for easy entertaining. 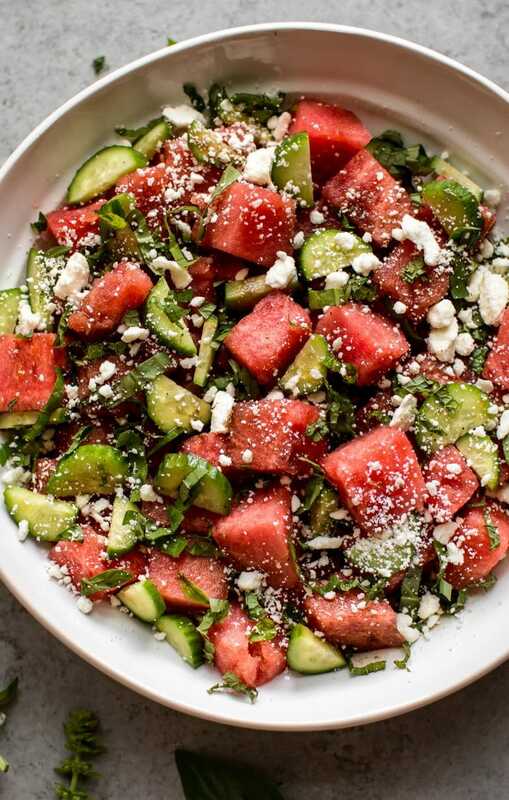 You can’t go wrong with this watermelon and feta salad. It takes about 15-20 minutes to make, and you can easily play with ingredient quantities and adjust as needed to suit your tastes. Watermelon screams summer, and it’s a wonder that I don’t have many watermelon recipes on this blog since it’s my #1 favorite fruit! I used a mini watermelon in this watermelon cucumber feta salad. You can always use part of a larger melon (I’d say around 1/4 of it or so). The mini melons are just so cute and are the perfect amount of melon in my opinion. Pro tip: If you didn’t know this, when selecting a watermelon, look for one that feels heavy for its size and has a large yellow spot (the darker shade of yellow, the better). The logic is that the darker that yellow patch is, the longer it’s been able to ripen. The yellow patch is where the watermelon has been resting on the ground while it’s growing. Why do watermelon and feta go so well together? Because feta is salty. I know some people who actually salt their watermelon. It sounds weird, but it really brings out watermelon’s flavor! What do you put in a watermelon salad dressing? I made a super simple dressing with balsamic vinegar and olive oil. 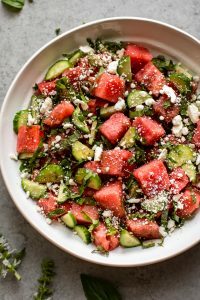 I hope you will enjoy this watermelon feta salad with balsamic vinegar dressing! Let me know in the comments below if you have any questions. What kinds of things do you like to include in watermelon salad? 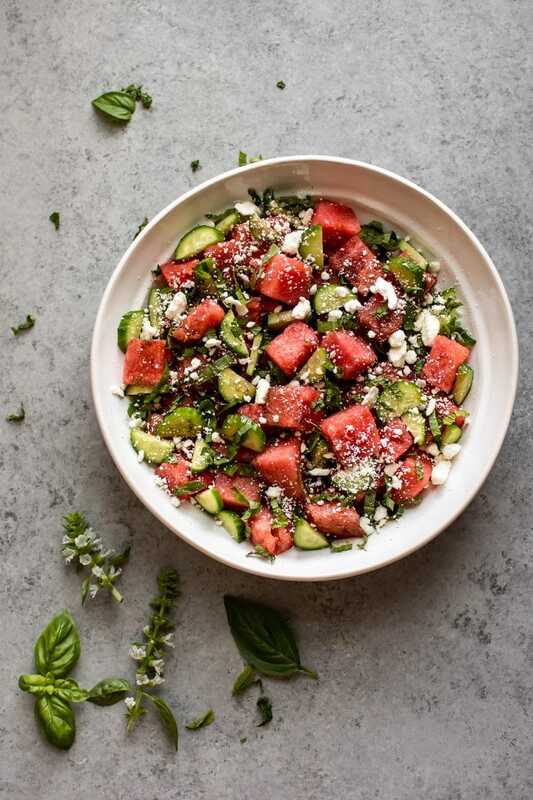 This watermelon feta salad recipe is a fast, fresh, and pretty summer salad that's really simple to throw together for easy entertaining. Prep your watermelon, cucumber, mint, and basil, and add them to a salad bowl. Add the feta as well. You can either add the vinegar and oil to a jar and shake it up or just drizzle a bit on top of the salad and toss like I did. I didn't put quantities because everyone's tastes vary, but I would start with 1-2 teaspoons balsamic vinegar and a tablespoon of olive oil and go from there. Season with salt & pepper as needed (feta is pretty salty so you may be able to skip the salt) and serve immediately. I encourage you to play with ingredient quantities in this salad to suit your tastes. Love easy watermelon recipes? Try my watermelon margarita popsicles for a fun grown-up treat! I am requesting this for our annual picnic. Or for lunch today. Bring me some now. Such a refreshing summer salad Natasha! I love the combination of ingredients!